As soon as you step through the gates at Dollywood, a rush of excitement will run through you. If you’ve never been to Dollywood before, don’t just head straight for the rides — take some time to explore the park and admire your surroundings. Not only does it have the friendliest park atmosphere in the world, but it offers the opportunity for you to immerse yourself in the beauty of the Smoky Mountains! You’ll even have the opportunity to walk through a replica of Dolly Parton’s childhood home and get a feel for how the country music legend grew up. After you’ve strolled through the park, it’s time to ride the rides! There is something for everyone, from the kids to the thrill-seekers. Families love riding the FireChaser Express, which is the nation’s first dual-launch family coaster. Riders will get blasted forward and backward as you race around the track. For families with young children, some of the best rides are Amazing Flying Elephants and Busy Bees. And you can’t forget the most classic ride of them all, the Village Carousel! There is even a lead horse that’s referred to as Dolly because of her blonde mane. After you ride your fair share of rides, take the kids to the Lil’ Pilots Playground or the Firehouse Fun Yard so they can run around and have some fun. Dollywood has a variety of shops for you to explore that have everything you are looking for! Whether you want a commemorative souvenir from your Smoky Mountain vacation or something to remind you of what a great time you had at Dollywood, you’ll be able to find it at one of the shops. We recommend stopping by The Dollywood Emporium, which is the ultimate Dollywood shopping experience. There is a large selection of apparel, hats, accessories and souvenirs, and even a special toy section that the kids will love! After your day full of fun at the park, you’re sure to have worked up quite the appetite. Luckily Dollywood has a number of delicious eateries where you can enjoy a family meal or grab a quick bite to eat. Try some of the world-famous cinnamon bread from The Grist Mill, share a slice from a homemade 25-pound apple pie, or try Frannie’s famous fried chicken sandwich! If you’re feeling really hungry, visit Miss Lillian’s Smokehouse for an all-you-care-to-eat buffet with items like fried chicken, roast beef, mashed potatoes and green beans. 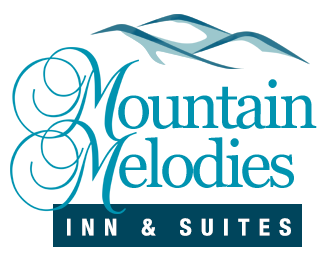 After your fun day exploring Dollywood, you’ll love only having a short drive back to Mountain Melodies Inn to get a good night’s rest. Browse all of our Pigeon Forge hotel rooms, and start planning your trip!